Giethoorn is a cute little town in the Netherlands that is famous for all its pretty bridges, canals and the fact that there are no roads. Giethoorn is a great destination for a day trip in the Netherlands, but you can also decide to spent one or two days in Giethoorn. In this post you can find facts about Giethoorn, 8 things to do in Giethoorn, tours to Giethoorn and practical information for your visit such as how to get there, where to park your car, where to eat and where to stay. 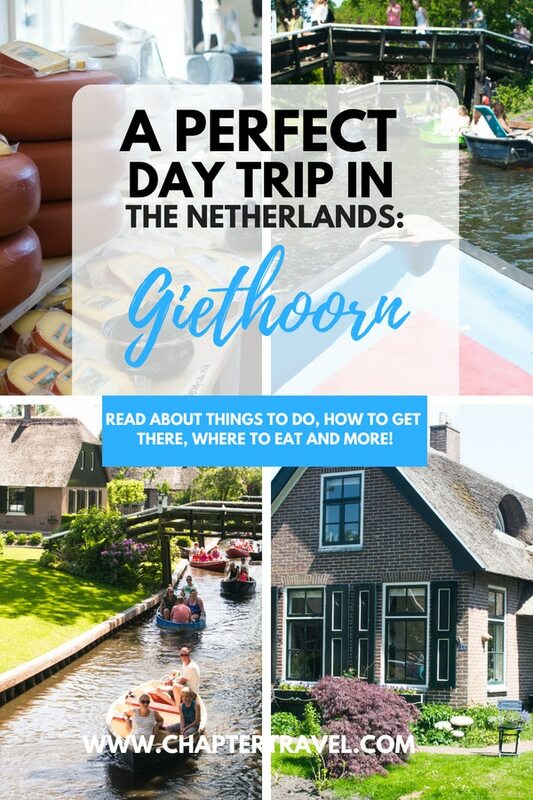 Guide to Giethoorn – Including things to do, tours and practical information for your visit! Giethoorn is a famous town in the Netherlands. The reason Giethoorn is so famous is because this little fairytale village has no roads or cars, just canals and bridges. People that live here travel around their town by boats. A nickname for Giethoorn is also ‘Venice of the North’. Giethoorn is only a small town with a population of 2630 people. There are only three neighborhoods in Giethoorn. In China you can find a park that looks exactly like Giethoorn, as they wanted to imitate it. The original name of this Dutch town was Geytenhoren, or Geitenhoorn (meaning goat horns). This is because they found horns of goats in when they started the town. 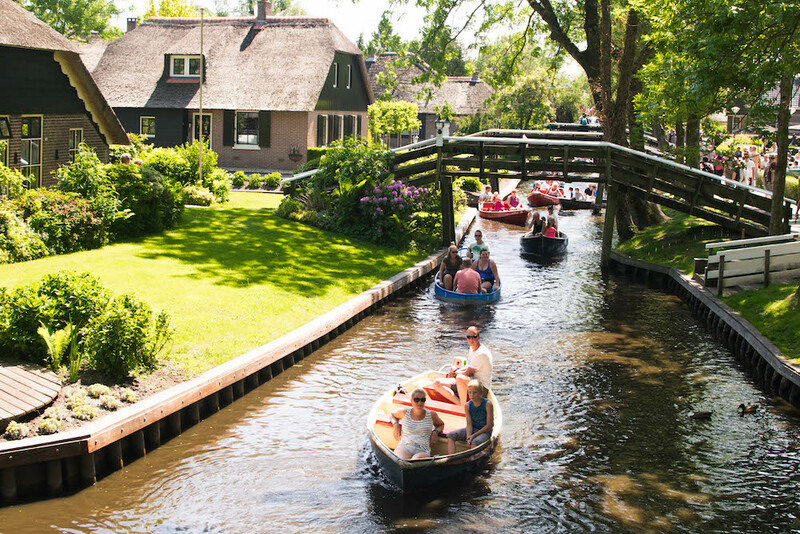 One must-do in Giethoorn is renting a boat and exploring the town by water. That’s why I advice you to go with a group of approximately four people and make sure one of them is brave enough to concur the waters. It’s not very hard to manoeuvre the boat through the canals, because it goes really slow and if you do bump into something, there is rubber on the edges of the boat that will soften the blow. To be honest, for me it was still quite a challenge, but I’m a bad car driver too… I was lucky to have some friends who are more talented boat drivers. When you have your own boat you can go as you please and stop whenever you want! If you don’t want to or can’t rent a boat of your own, you can also decide to go with the canal boat tour. My friends and I made the decision to visit Giethoorn during Whit Monday, which is one of the busiest days of the year in Giethoorn. This means it was quite hard to rent a boat in the middle of the afternoon, but we managed to do it anyway with some patience and perseverance. 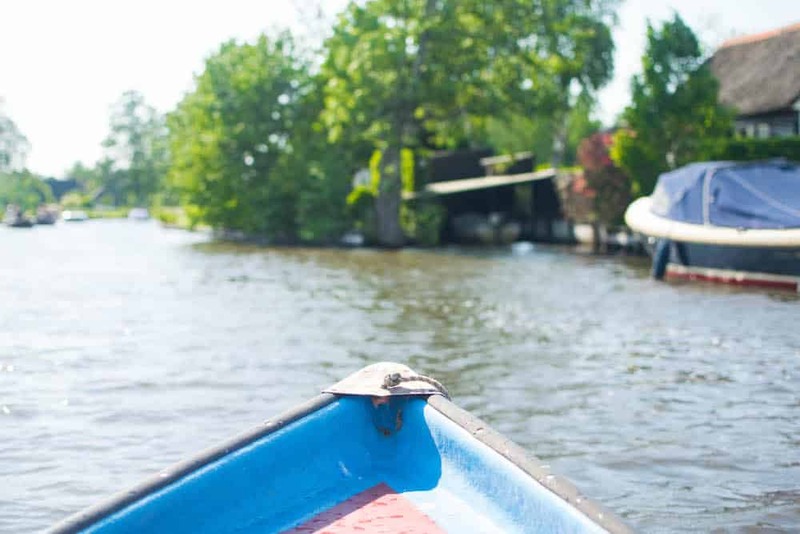 Although Giethoorn can be busy during the holidays and sunny days, it’s not always so hard to get a boat. Just walk around and look for a boat rental sign and ask if they have a boat. You can also call most of the rentals before your visit and make a reservation. 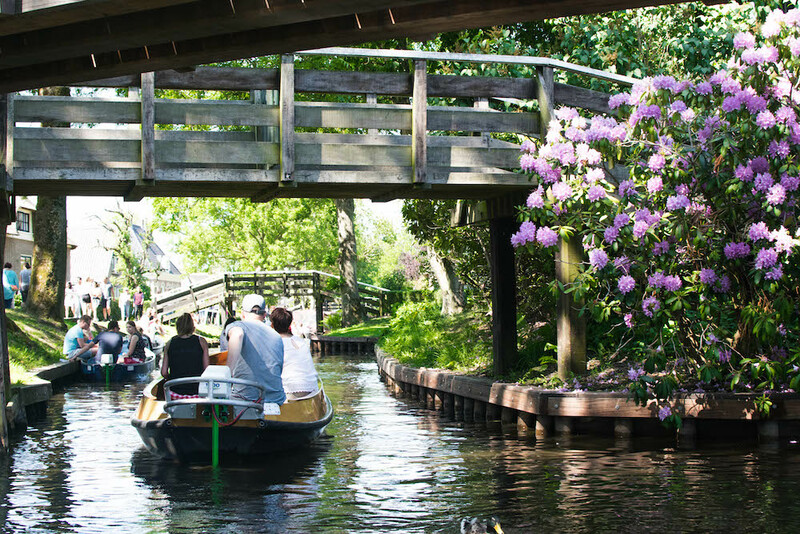 Around Giethoorn you can find Weerribben-Wieden National Park, which covers 100 square kilometers of land. Weerribben-Wieden National Park is the biggest peat bog area in Northwest Europe. Here you can find all sorts of plants and animals, because of the large amounts of water and dozens of grassy spots. You can boat around this area and enjoy its rich, natural landscape. Next to boating around in Giethoorn, you can walk around on the footpaths and admire the houses with thatched roofs and colourful facades. Check out some of the pretty wooden pedestrian bridges and take a photo from one of the public-owned ones. Be sure to wander off the main foodpaths near all the restaurants to have a bit of peace and quiet. Giethoorn offers multiple museums that you can visit. For instance Museum de Oude Aarde, ‘t Olde Maas Uus, Museum Gloria Maris and The Histomobil. Below I share more information about each of them. The name of this museum means ‘The Old Earth’, which is very fitting as here you can find gemstones and other ancient minerals. There is quite a collection here with interesting fossils and geographical specimens. 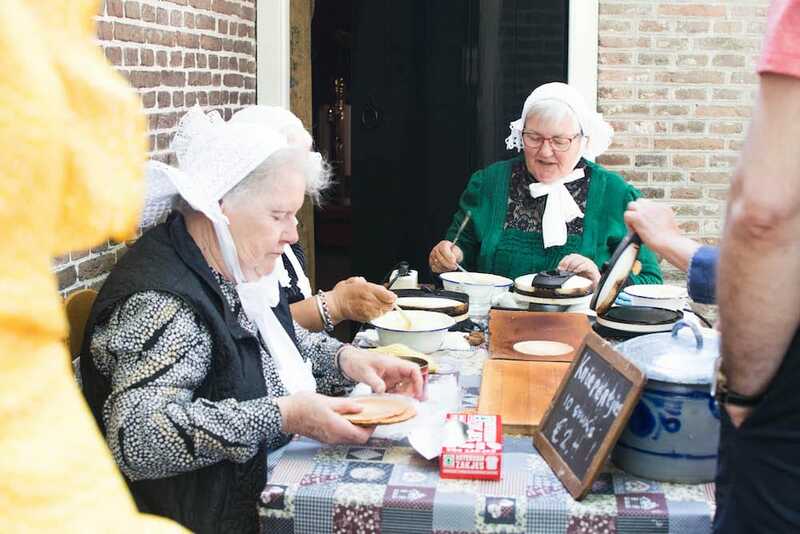 In this museum, actors act as if they’re in Giethoorn during the old days and show aspects of the town’s past such as farming, fishing, peat mining, making kniepertjes and more. It’s a great way for visitors to learn more about the rich, rural history of Giethoorn. This museum is specialised in old cars and provides a big collection of cars, bicycles, motorcycles and carriages from all over the world. 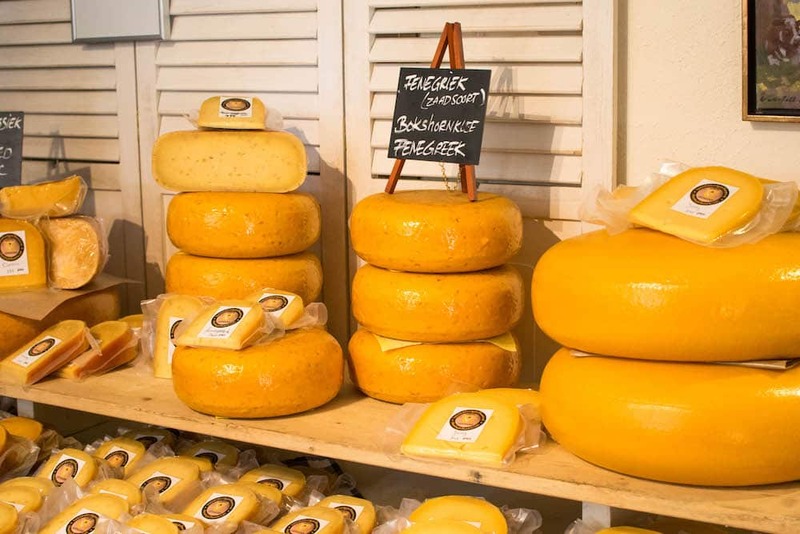 One of the shops I went with my friends was a cute little cheese shop called Kaasmakerij Giethoorn. Here we could taste all sorts of cheeses, such as fenugreek cheese, goat cheese, wasabi cheese, pesto basil cheese, truffel cheese and basically anything you can think of. Of course I had to buy a block of cheese too. The Dutch really know how to enjoy a delicious snack! Sit down at one of the terraces, order a cold drink and a snack to go along with it. In Giethoorn there are many terraces where you can relax and eat delicious Dutch snacks, such as bitterballen, kroketten or if you don’t eat meat like me: poffertjes. Like I mentioned before, at ‘t Olde Maas Uus Museum actors show the way of life of Giethoorn’s past, such as making kniepertjes or knijpertjes. These are sweet, thin waffles, sometimes eaten flat or rolled up. You can buy 10 of them for 2 euros at the museum. Another great Dutch snack. If you don’t feel like eating at one of the restaurants or terraces, you can always decide to bring some food with you. Bring a cooler and a blanket and sit down at one of the grassy spots along side the canals. We did this when we had to wait for quite some time for our rental boat and it’s a great way to pass some time! But you don’t necessarily have to go to Giethoorn on a tour. You can go here by yourself using public transport or by car! I always advice tourists to check out 9292.nl whenever using public transportation in the Netherlands. Here you can easily fill in where you want to travel to and from where you are travelling from. 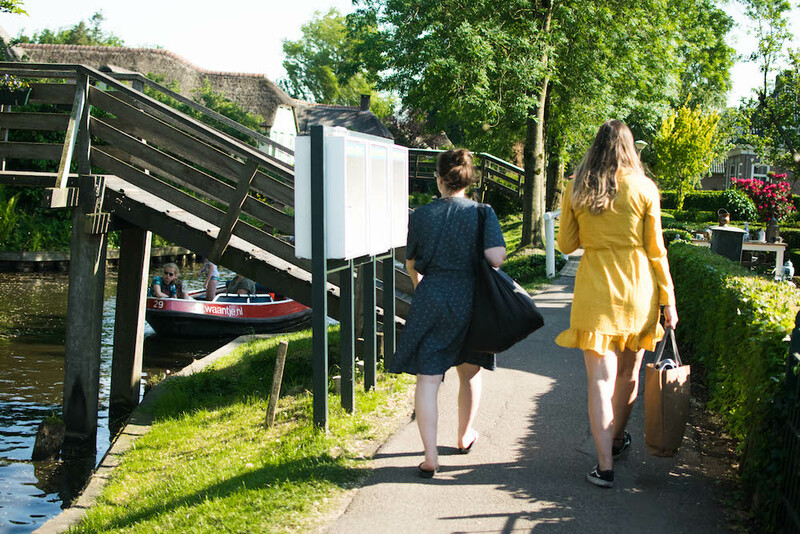 You can travel to Giethoorn by public transport. The easiest way to get to Giethoorn by public transport is to travel by train to Station Steenwijk. From here you can grab the bus (270 or 70) to Giethoorn. Line 270 is the Giethoorn Express that operates daily from April the 29th until October 27th. Line 70 drives every day between Steenwijk and Giethoorn. Whether you’re travelling from Amsterdam or Rotterdam, I advice you to leave early. From Rotterdam it can take up to three hours and from Amsterdam two hours. The easiest and fastest way to travel to Giethoorn is by car. Even though there are no roads in town, you can definitely still use the car to get there. Around the town center there are various parking possibilities which are accessible for (tour) busses and cars. It’s about 1.5 hours from Amsterdam and about two hours from Rotterdam (road trip!!). 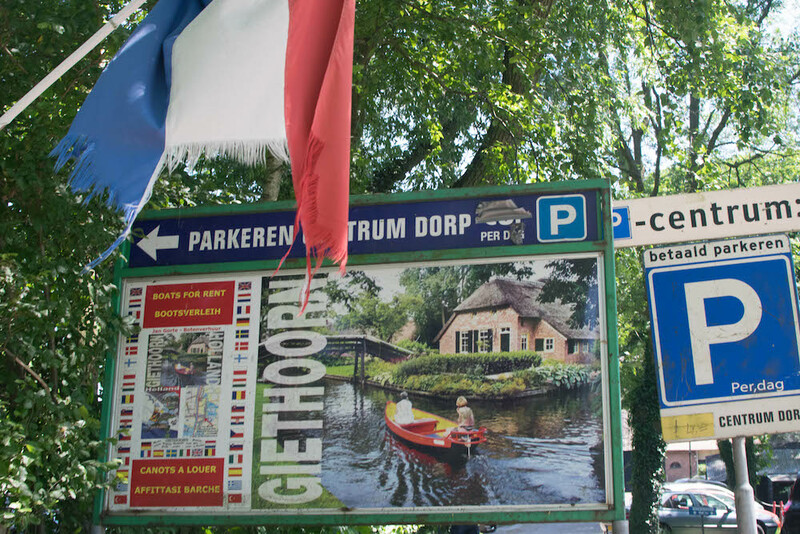 If you decide to go to Giethoorn by car, you need to find one of the parking lots. We stayed at the parking lot near the center. It was very easy to find and form here we could easily walk to the canals of Giethoorn. Even though we arrived in the middle of the day on one of the busiest days of the year, there was still a parking spot available. They have a whole field. 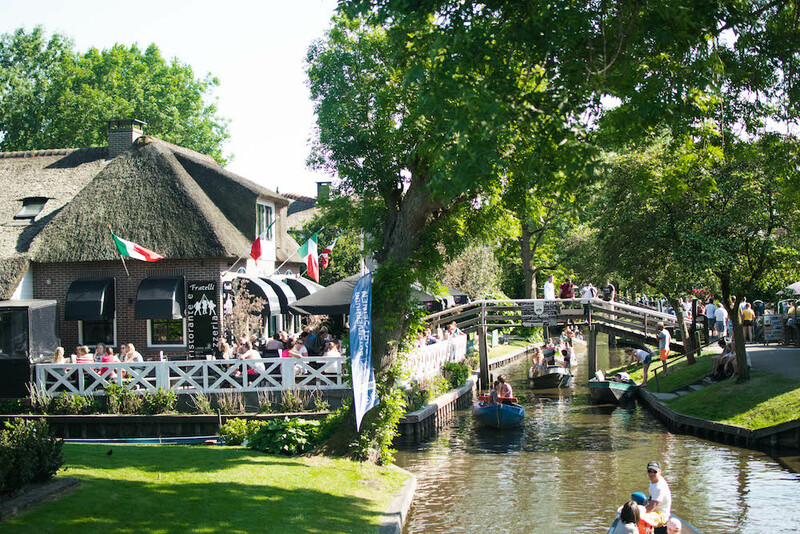 There are plenty of good restaurants at the canals of Giethoorn. Whether you crave Dutch, Italian or seafood, it’s all possible. It’s not hard to find a restaurant, because there are plenty. But if you need some inspiration, you can find 5 great options for lunch and dinner in Giethoorn below. Most of these are quite popular, so it can be quite busy. At De Eetkamer van Giethoorn, or in English ‘The Living room of Giethoorn’, you can get Dutch, seafood and vegetarian food. During sunny days you can sit outside on the terrace, and when the weather is chilly you can sit inside and get cosy and warm. Ristorante Fratelli is perfect if you love Italian food. You need to cross a bridge to get to the restaurant (see the photo above) and you can sit outside on the terrace. Fratelli is the perfect place if you’re craving a delicious pizza or tasty pasta. They also have vegetarian options. Be sure to leave room for some ice-cream! Otterskooi also has a great location at the water and offers a terrace, bar and restaurant. At the bar you can enjoy some drinks before you start dinner. It’s also possible to eat privately with a group here, as they have multiple small dinning rooms. You must try some Dutch poffertjes if it’s your first time in the Netherlands! Of course you can get some in Giethoorn as well. Poffertjes are small pancakes with butter and sugar powder. Pannenkoeken & brasserie de With Hoeve offers delicious pancakes, poffertjes and other sweets! Named after Giethoorn’s nickname, Hollands Venetië offers large terraces with a view of Weerribben-Wieden. You can go here for soups, sandwiches, pancakes, typical Dutch snacks such as kroketten or frikandellen, burgers, fish and much more. They also have two vegetarian options. Are you planning on staying in Giethoorn? This is definitely possible! If you’re going during the holidays it’s recommended to book your accommodation a few month before, as the best ones can sell out soon. Hotel B&B d’Olde Smidse: Great location, breakfast included and an reasonable price for good quality! Hotel Giethoorn: Great location and breakfast is included. This is a bestseller on Booking.com, so if you want to stay here be sure to book on time. Gieters Grietje: Great location, there is a garden, terrace and a barbecue facilities. Another bestseller on Booking.com, so be quick if you want to stay here. 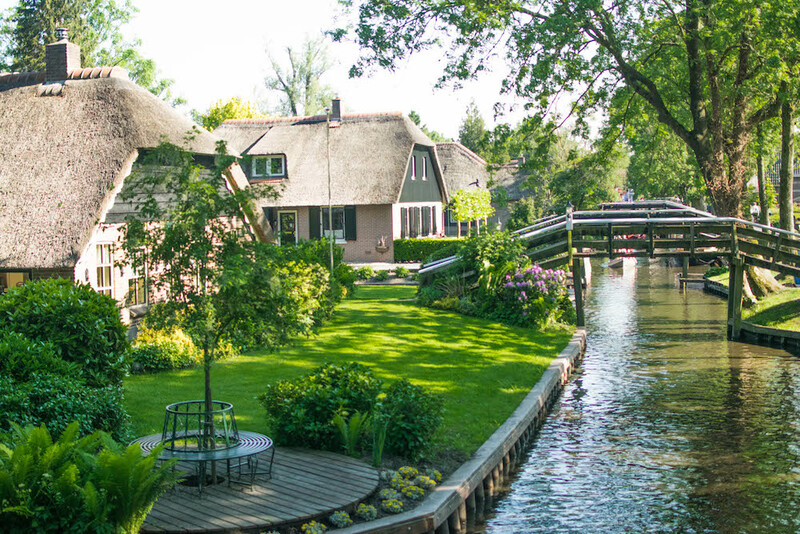 Have you ever been to Giethoorn? Wow, it looks like something out of a fairy tale. I love that you can’t drive inside it and a boat ride there looks lovely.